When Pigs Fly Returns: When Pigs Fly Returns 500th Post Spectacular! When Pigs Fly Returns 500th Post Spectacular! As the title implies, this is my 500th (published, existing, non-deleted) post on When Pigs Fly Returns. I consider that quite the landmark—it’s not a number I ever considered reaching. WPFR is a blog I write for when I find the time to do so. You’ll note that the first post was back in March of 2007, but even that number is dubious. Longtime readers may remember the original “When Pigs Fly” blog that was abandoned because my then-current Gmail account became corrupted and I couldn’t sign into Blogger anymore. So I started another site called “When Pigs Fly: Part Deux,” but then I forgot…the new password. Brilliant, right? Well, it’s a miracle that hasn’t happened during the almost three-year history of WPFR, but here we are, right at 500 (published, existing, non-deleted, current blog) posts. So even though this concept is a very long time from completion, I thought I’d share with you readers a Very Big Step I’m taking. This is an idea I’ve been developing since I started doing sketches for the Silk Succubus, and probably even before that, subconsciously, seeing as I’ve struggled to develop a female character for a very long time. Meet Lilem Beatrice Mephistopholese, who will (someday) star in a page-length weekly comic called “Life on Leather Wings.” I have more of a vision for Lily than I’ve had for any iteration of Selena. I can see what she does from morning until night, and the adventures she has. Her social interactions, family life, and unique role are all crystal clear in my mind. Like Mr. Craven said before, we dream in fire but work in clay. I can see it in my mind, but hopefully that art class next semester will help me mold the clay myself. Having said that, I certainly wouldn’t mind collaborating with another artist out there. Lily is a Lilem, a daughter of Lilith and fathered by Mephisto. Lilith, of course, is the mother of all Succubi, and all of her children are known as Lilem. The children take their father’s name as a last name to differentiate themselves from each-other. Lilith gives all her daughters differentiating middle names and addresses them by that name. So Lily would be “Beatrice” to her family members. However, she prefers “Lily.” She has seven paternal sisters. Their job is to tempt human men on Earth and then steal their souls through physical (not necessarily sexual) contact. Fresh souls sustain the Lilem and end up in Hell where they become part of Satan’s ever-expanding army. Lily’s sisters take their jobs seriously, but Lily herself has a stronger sense of justice than most Lilem and tries to only steal souls that she believes are corrupt or deserving of eternal damnation. Mortal food provides no sustenance for Succubi—only a diet of souls. Luckily, a single soul can sustain a Succubus for several weeks (like an anaconda). Lilem inherit demonic features from their father. In Lily’s case, that means enlarged canines (some of her sisters can protract/retract them) and large bat wings. Other Lilem are decorated by bony spines or cranial horns. All Lilem can “turn off” their demonic features on the mortal plane. Her father (Mephisto) disapproves of her “freewheeling” lifestyle, and has cursed her to not be able to hide her wings or canines. Lily lives on Earth despite this handicap, though she is mostly active at night in the public sphere. Unlike her sisters, Lily’s wardrobe is hampered by her omnipresent wings. In fact, I’m still working on her costume(s). When out and about, her wings present some degree of inconvenience. Obviously, Lily flies whenever possible, but when she has to walk among the people, she wears a large overcoat or a cape. She lets her wings out on Halloween, though, and usually gets a lot of compliments on them. Lily is 5’6” tall, about 120 pounds, and her measurements hover around 36-24-38. She has black hair and sea-blue eyes. I haven’t nailed down her wingspan, but it’s a bit more than 10 feet. 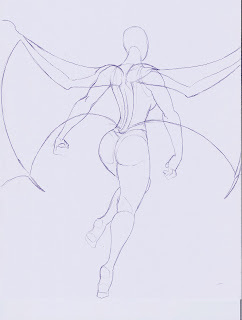 The wings originate over her shoulderblades. Like a bat, she can fold them up pretty tight. Unlike bat wings, Lily’s are tetradactyl. Her first wing-finger is short, semi-opposable, does not contribute to the wing surface, and is tipped by a large recurved claw. The other three wing-fingers are connected by a strong cheiropatagium and end in long pointed claws. A narrow propataium extends between the wing-shoulder and wing-wrist. Lilem are immortal, and most wounds heal on their own—even torn-off limbs. However, Lilem will “die” if they are starved of souls or the head is removed from the body. They can also be killed if injured by certain holy weapons. Killing a Succubus by starvation merely sends the demon back to Hell, where it recovers. Beheading or killing by holy weapon actually does “kill” the Succubus: they disappear from the mortal plane and end up on the shores of Purgatory, where escape on one’s own is impossible. Curiously, Succubi are not a major concern of Heaven. Exactly why is currently unknown (but will be explored). However, high-ranking demons—individuals who originally participated in Satan’s rebellion especially—are the target of immediate retaliation from Heaven’s Vanguard if they should ever cross into the Earth Realm. Hell’s generals live in the dread City of Dis, and train Hell’s army for the inevitable second war with Heaven. Satan does not reside in the 9th Circle but moves between them at will, overseeing military operations and obsessively planning his vengeance. So that's the basis of the story. The comic will open with Lily showing her younger half-sister, Gwendolyn, "the ropes," as it were, to introduce the reader to Lily, her world, and her role in it. After that, I'll examine how Lily hunts her prey, explore her relationships with her sisters, and introduce more fiendish characters like Incubi and my vision of Hell's geography. Like I said, I'll be taking art classes in the near future to hone my craft, and I'm very excited about this project, having gone so far as to script out the first few pages. I'm also not against collaboration, so if you're a talented artist out there who's interested in helping out, drop me an email. Either way, I think this will be an awesome project. ZOMG. I have an idea. It's a bit...strange, to say the least, and somewhat unorthodox, but say that there's a bar or something, or someplace where Ms. Lily needs to unwind, or just get some thoughts or feelings off her mind. Guess. Who. I. Think. She. Can. Talk. To. A Mr. Frank, an aardvarkian creature or demon who has the attitude of my "Frank." He is a creature with the same lackluster personality, but a startlingly clear/painfully cynical view on society and life. Terrific sketch, Zach. That's a tough pose. My wife has this backless summer top, with ties at around the neck and waist. Looks like Lily may need clothes like that. Oh, also, congratulations on 500 posts, and I hella dig your idea. That's just badass. Well sir, I have to say I'm impressed with the post 500. I've been watching closely to see where you went with this thing, but it looks like you could have a very interesting story going here. Looking forward to it for sure. Most definitely follow through on this thing. I'd read/buy it probably. Ok buying may be pushing it right now, but I'll enjoy it for sure! !